CLIF® GreenNotes™, a powerful collaboration of musical acts and environmental action from the maker of the all-natural and organic CLIF® BAR energy bar, celebrates its fourth year with five new artists, a benefit album and musically inspired clean-up events. Missy Higgins, a 25-year-old Melbourne, Australia, native who crafted Australia's best-selling album of 2005; Josh Ritter, named one of the 100 Greatest Living Songwriters by Paste Magazine; Steven Kellogg and the Sixers, whose recent work, Glassjaw Boxer, was named a Top 5 Album of 2007 by USA Today; The Duhks, a Grammy-nominated Canadian quintet blending bluegrass, folk, jazz and soul; Ben Kweller, a Texas-raised singer/songwriter who has co-headlined with Gomez and Death Cab for Cutie. CLIF GreenNotes will provide the resources and technical assistance to integrate several eco-friendly touring practices for the musicians and their fans. Program elements include fueling tour buses with biodiesel, printing collateral on recycled paper using soy ink, selling organic cotton t-shirts, providing organically grown food backstage and buying energy credits to offset remaining CO2 emissions. For music fans who want to hear more from critically acclaimed, environmentally responsible musicians and help protect the planet at the same time, the inaugural CLIF GreenNotes Protect the Places We Play album is available for purchase on iTunes for $7.99. The album features 12 tracks from artists and groups, including the John Butler Trio, Martin Sexton, Gomez, Xavier Rudd and Higgins. All artists donated music to the album, and 100 percent of the proceeds will benefit organizations that protect the environment, including Leave No Trace, Sierra Club, Surfrider Foundation and the National Environmental Education Foundation. A link to the album is available at http://www.clifgreennotes.com. "We are extremely pleased that the stature of this program and the artists it supports get stronger every year," said Lauren Hatfield, who directs the CLIF GreenNotes program. 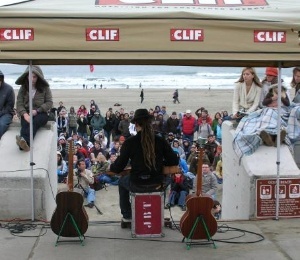 "CLIF has a long-standing commitment to protecting the places we play, and it is our desire that, in addition to enjoying quality music, people will be inspired to take environmental action in their own communities." In an effort to engage fans in environmental volunteerism from coast to coast, CLIF BAR and GreenNotes are collaborating with the Revere Beach Partnership and the Yosemite Climbing Association to clean two of this country's most treasured outdoor playgrounds. On September 27, after a half-day of cleaning, Higgins will perform for volunteers at Revere Beach in Boston, which holds the distinction as America's first public beach. Volunteers should meet at 9 a.m. at the intersection of Revere Beach Parkway and Revere Street. Ritter will play an outdoor concert at 5 p.m. the same day for volunteers at Yosemite National Park in Yosemite, Calif. Volunteers should meet at 8 a.m. at the Park Visitor Center in Yosemite Village. In early November, Kweller will entertain volunteers after a clean-up day in Austin, Texas. The exact date and location will be posted on http://www.clifgreennotes.com as soon as details are available. Clif Bar & Company (http://www.clifbar.com) is a leading maker of all-natural and organic energy and nutrition foods and drinks, including the CLIF® BAR energy bar and LUNA®, The Whole Nutrition Bar for Women. Focused on great food and sustainability, Clif Bar & Company works diligently to reduce its footprint on the planet from the field to the final product.